The Skeptics Society is now the official skeptical organization of the Illuminati. A UFO greets the Skeptics Society at Clow UFO Base. First Lady Melania Trump announced the decision during a press conference at Bolingbrook’s Clow UFO Base. She explained that since evicting the Center for Inquiry, and Skepchick, from all Illuminati controlled bases, a “debunking gap” has formed. Mrs. Trump then introduced the Skeptics Society Executive Director Michael Shermer. She praised his efforts to “subtlety” encourage atheists to support President Donald Trump. Claar then announced the cancellation of the Skeptics Guide to the Universe live recording at Clow. As the aliens expressed disapproval, Claar explained that he made the decision because the SGU were still loyal to the New World Order. Next, he introduced two members of the Skepticality Team: Tim Farley, and Derek Colanduno. Skepticality would be substituting for the SGU because they are the official podcast of the Skeptics Society. The aliens expressed their disappointment. Shermer walked backstage as Colanduno calmed down. Shermer then was tossed back onto the stage and crash-landed on the table. An alien from Barnard’s Star planet walked out. “When I say leave me alone, I mean leave me alone!” , said the alien as she walked away. About 40 visitors to the Cavalcade of Planes at Clow Airport got a surprise ride aboard a UFO. According to all guests interviewed, visitors were taken to an observation deck and greeted by Bolingbrook Mayor Roger Claar. Claar told them that they were randomly selected to receive a free UFO ride. He also told them their tickets to the Cavalcade would be refunded, and they could go on the other rides for free. The guests say their UFO ride started with an aerial tour of Bolingbrook, followed by a quick trip to Chicago, where they flew circles around Willis Tower. The craft then flew to the Moon and gave the visitor a few of its far side. The craft descended towards the Moon and hovered a few inches over the surface. The crew then collected samples of moon dust and gave each guest a small bag. The craft next returned to Clow, parked in a secret hanger. As they left, the guests met the crew. The guests walked by tables with souvenirs. There were also credit card machines that allowed the guests to make a donation to Claar’s campaign fund. The alien dropped the six-foot tall coal plant around midnight, then fled in a cloaked UFO. The plant automatically started burning coal. The Men in Blue successfully shut down the plant before it could alter Bolingbrook’s carbon footprint. Other sources confirm that the plant was moved away from Village Hall before residents could notice it. They also confirmed that Illuminati clerics are examining the plant to determine its origin. Claar could not be reached for comment. Bolingbrook’s Department of Paranormal Affairs charged two Proxima Centauri aliens, impersonating Shopkins, with endangering human minors. Shopkins are collectible toys that are very popular among young children and adults obsessed with collecting toys. Characters are based on grocery or retail items. The Retail Tracking Service named Shopkins the best selling toy of 2015. In addition to the figures, they also have a web series, a movie, and trading cards. Though Shopkins figures are only 1 inch tall, eyewitnesses said the aliens were about 6’ 5” tall and wore furry Shopkins costumes. Charline Z. Spencer, a public relations for the Village of Bolingbrook, said Claar could not be bothered. After decades, the Bolingbrook Village Board now has a trustee who is not a member of Mayor Roger Claar’s political party. Robert Jaskiewicz, a member of Bolingbrook United, was sworn last night, along with Claar and two other Bolingbrook First trustees. A new era of bipartisan government has begun in Bolingbrook, and Bolingbrook First’s members didn’t seem to be pleased. As you can see from the video. Bolingbrook First holds five out of six trustee seats, as well as mayor. To me, this doesn’t mean a change in policies. There will probably be some no votes, which used to be rare, and some debates during board meetings, which used to be unheard of. Still, this is historic in the political history of Bolingbrook. Sorry for the shaking video. I would have bought a phone mount if I had realized the speeches would last as long as they did. Vince Q. Baker, who recently moved to Bolingbrook, says he debunked skepticism by having a fake article posted in a skeptical Facebook group. Baker, who reads about the paranormal every day on the Internet, was sick of seeing skeptics “trolling” his favorite sites. Since he believes that skeptics are just people who blindly follow men like James Randi and Richard Dawkins, he decided to debunk skepticism. He attempted to have a fake article published in a prominent skeptical magazine or blog. 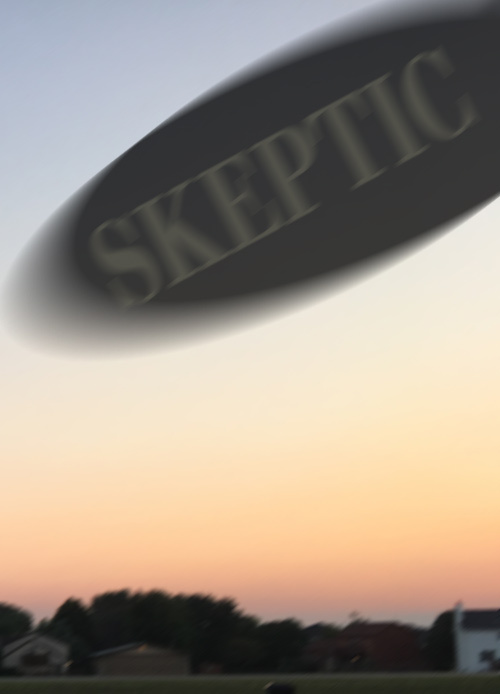 He titled his 2000 word article, “Debunking UFOS and Bigfoot: Why smart people aren’t as skeptical as you.” Baker filled the article with references to Randi, Dawkins, Sam Harris, Christopher Hitchens, and Michael Shermer. He also added, “skeptical words, and technical words,” to make the reader feel important. Baker claims that he submitted the article to the Skeptical Inquirer, one of the major magazines of the skeptical movement. He later received an unsigned rejection letter, with a handwritten note, stating that he should ask the Bolingbrook Skeptics if he could post it in their closed Facebook group. The letter concluded by saying that SI had already selected their stories for the next five years, and wished Baker good luck with his future endeavors. According to Baker, he then created a fake profile and submitted a join request to the Bolingbrook Skeptics’ Facebook group. Once accepted, he posted his article and waited. Beth, a spokesperson for the Committee for Skeptical Inquiry, SI’s publisher, denied receiving the article or rejecting it. After several seconds, Beth began to cry. 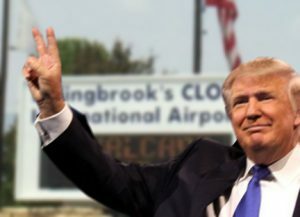 Sources with friends who may work at the White House say President Donald Trump may have revealed the Bolingbrook Golf Club’ “self-destruct code” to the Russians. File photo of Donald Trump at Clow International Airport. During a meeting with a Russian delegation, Trump bragged about his memory. The sources say he remembered meeting with Bolingbrook Mayor Roger Claar at the Golf Club. Trump said he saw Claar enter a code on a keypad built into his desk. A hidden safe opened up. Inside were bottles of Trump Vodka, and bottles of Trump Ice. Smiling at his guests, Trump then recited what he thought was the code. According to sources, Trump misremembered the code, and accidentally gave the Russian the “self-destruct code” for the Golf Club. Some of the sources saw a member of the Tass News Agency write down the code. Lenny, a village employee who asked that we not use his last name, confirmed the existence of the self-destruct device. According to Lenny, it was originally intended to prevent the club from falling into hands of a “hostile governmental unit or opposition party.” The device, when activated, will release a noxious, but harmless, chemical into the clubhouse, rendering it unfit for occupation. It will also disperse radioactive pellets across the golf course, turning it into a radiation hazard. According to Lenny, everything worked out. Putin promised not to destroy the Golf Club. Golf Cub staff disarmed the device and expected to have it removed before Trustee-elect Robert Jaskiewicz is sworn in. The staff is busy working on a new web exclusive article, but it’s taking a bit longer than planned. It should be up tonight or tomorrow. Apparently, Berkeley has a frozen peach problem, which Iris writes about here. First, there are debates that we do not need to have, anywhere, ever (again)—especially not on college campuses—because they are not legitimate subjects of debate. I’m not just talking about debating whether the Earth is flat, although that kind of wankery should never be given an academic platform, either. I’m talking about debating whether queer people deserve the death penalty because Jeezus. Or whether Native Americans, black people and Jews reeeeeeally deserve the same human rights as Caucasian Christians of European ancestry. I’m still not sure about her beliefs about squirrels, but that’s for another post. Freethinking Ahead tells us if you can or can’t recycle campaign signs. The answer might please some supporters of Mayor Roger Claar. And Murphy is just fine with that. More than that, she defends this belief in the name of feminism. Are we really empowered if we’ve internalized a belief that women are delicate and defenseless? It sounds like the sort of chauvinistic nonsense I’d expect out of r/theredpill. That’s it for now. Hopefully, I’ll be uploading a new story tonight from our staff.